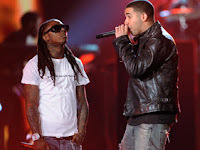 Double Up Radio: Drake Debuts New Tracks With Lil Wayne And T.I. 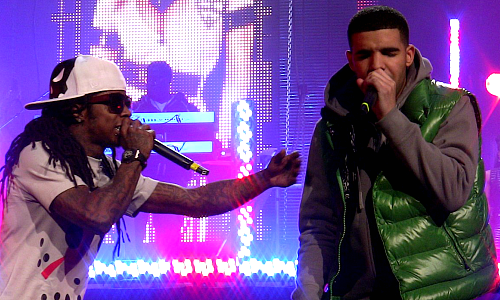 Drake Debuts New Tracks With Lil Wayne And T.I. 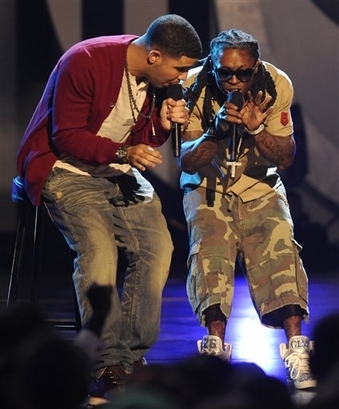 With just two weeks until he releases his sophomore album, Take Care, Drake blessed fans in L.A. with new music when he debuted "The Motto" (featuring Lil Wayne) and T.I. 's version of "Headlines" on Power 106 Monday night. "The Motto" is believed to be Take Care's last bonus track, though a track list on Zune's website has the song as "Untitled." Regardless of where it will end up and how it will be placed, the Weezy-assisted song is equipped with a deep rolling bass and staccato drums — a real party starter. From the first few bars, Drake throws it up for his YMCMB fam and responds to Luther Campbell's claim that non-Miami natives Lil Wayne and DJ Khaled should pay tithes of some sort considering that they now live in the city. Drake throws a not-so-subtle nod to the 2 Live Crew legend's jabs spitting, "Tell Uncle Luke I'm out in Miami too/ Clubbin' hard, f---in' women, there ain't much to do/ Wrist bling, got a condo up on Biscayne ... ain't sh-- change." Drake also pays homage to late Vallejo, California, rapper Mac Dre, who was gunned down seven years ago Tuesday (November 1). "I'm in the building and I'm feeling myself, rest in peace Mac Dre/ I'mma do it for the Bay, OK," Drizzy respectfully spits. For the final verse, Wayne utilizes his usual free-associative rhyme pattern with lines like "Talk stupid, off with ya head/ N---a money talks and Mister Ed" and "Ain't sh-- sweet, n---as on the streets like hookers." For his second premiere of the night, Drake unveiled T.I. 's "Headlines" freestyle. As soon as the beat drops, T.I. makes the beat his own, adding an original flow to the popular beat. "I ball all night, go hard all day, fall deep up in your broad all day," he starts off his verse. "I liked the record and it was spazzin', and I felt like, 'Let's see what I can add to it," T.I. told MTV News correspondent Sway Calloway about his version of "Headlines" when he visited his "Sway in the Morning" radio show on Shade 45 in October. Since being released from prison in September, T.I. has gotten on a number of high-profile rap songs like Future's "Magic," the Throne's "N---as in Paris" and now Drake's "Headlines," and while each freestyle has been well-received, Tip admits that he wasn't exactly commissioned to jump on the tracks. "None of these people approached me. I did it and got with them [after] and let them know that I did it."